Note: This article is for use by Billing Administrators or those club members that handle billing and invoices. The bulk invoice function allows you to generate invoices for ALL members at one time. Typically a club will have members that will be billed different amounts. For example, a club will have “regular” members that are billed one rate and “senior” members that are billed a different rate. Some clubs have an option to pay for meals or coffee for the year. The system allows for billing different types of members using billing codes. 2. Locate Billing under the Financial heading and select it. 3. Click the red Administration icon and select the Bulk Invoicing option from the list. 4. The Bulk Invoice Creation page allows you to set the criteria for the bulk invoices. Bulk invoices are created based upon member type. The Generate invoice based upon member type option should already be selected. 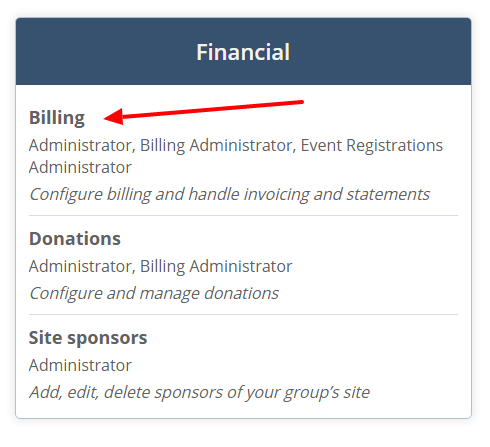 Note: If you are creating invoices for all members but are using billing codes instead of member type, deselect the first option, Generate invoice based upon member type. Use the advanced options listed (options 2 and 3) to create invoices for members based upon billing code. You will not use these options often. When the second and third options are selected, you will be provided with an opportunity to match billing codes to those assigned to members or to add billing codes to each selected member for this invoice only. 5. Select the invoice date and due date. 6. Select a discount that would be applied to all invoices, if applicable. Email all invoices option - Email template that was set up during the configuration process will be emailed to members with a link to access the online invoice. Clicking the Create Invoices will trigger the email to be sent with a link to access the invoice. Add all invoices to print queue option- This function makes all invoices available in the print queue for easy printing. Once invoices are placed in the print queue, return to the main Billing page and click the Print queue button at the top. Apply credits to the invoices option - This option applies any credits to the member invoice. 8. Click the Create invoices button. If you selected email all invoices, the emails have been sent. If you selected add all invoices to print queue, return to the main Billing page and click the Print queue button to print invoices.